This is my fourth time in Boracay, and though I’m quite familiar with the island already, there are still some things and places that I’ve yet to experience. For once, we did not board the boat at the Caticlan Jetty Port. The Seair shuttle van (complimentary to all Seair passengers) took us to the alternate port — smaller, but has relatively calmer waters during the habagat season (southwest monsoon). From there, we rode for five minutes to Boracay Island’s alternate jetty port: Tambisaan. Like the alternative port in Caticlan, this port is smaller, and there’s some ways to walk to get to the tricycles that would take you to the three stations. Coming to Boracay in the off peak season is also a first for me. The island is so different this time of the year than during my previous visits. The wind in the white beach is blowing really hard throughout the day that the shops facing the beach all have see through plastic along the beach and their storefronts to protect their customers and their wares. The waves are also the biggest I’ve ever seen in Boracay (though it’s still comparatively small to other beaches in the country). This is going to be an interesting trip. Two more firsts: it’s also my first time to try Zuzuni and Real Coffee. As Seair passengers, Melo and I get 10% off our bill at selected establishments in Boracay. We had our fill of Zuzuni’s Z Burger, gyros, tzatziki, and pita pizza, and enjoyed the discount care of Seair. 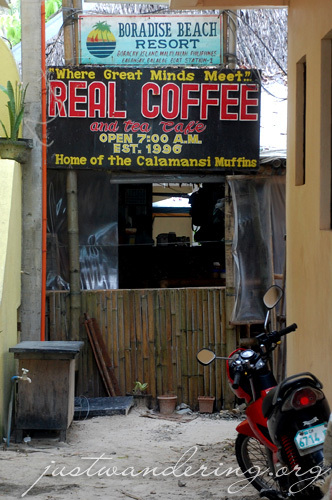 Real Coffee, on the otherhand, is a cafe that I’ve been wanting to try for the longest time, but haven’t been able to since I couldn’t find the cafe. Tucked inside an alley, it really *is* a hidden gem. Seair is giving a great treat at the Philippine Travel Mart at the SMX. Buy 1 Take 1 tickets for Batanes, and discounts as much as 75%! Now you don’t have any reason not to travel. 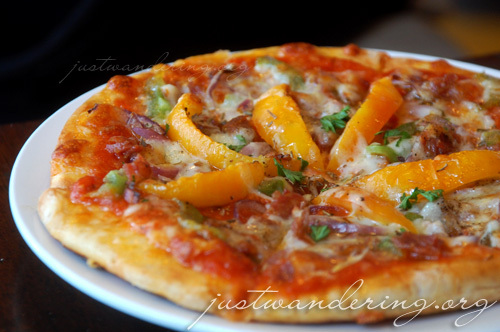 Zuzuni’s Pita Pizza looks tempting and yummy, did you like it?? That pizza looks like a Turkish lamachun for me. Oh hey, Zuzuni’s owner must be Turkish! If not, must be Cypriot or Greek. Hihi. Any clue? Thinking very seriously about retiring to Boracay — but on a Ltd budget ??? i have never been to Phill before and would love to experience it. I would pay up front for a years rent and enjoy the is land — ime 53 years old guy from UK. hi Nina! 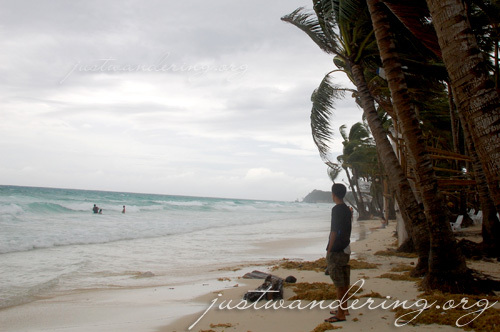 i like your travel blog to Boracay! its going to be my first time travel next year 2011 to this place and getting to be acquainted here gives me lots of insights on what to expect! Thank you so much! !